Indianapolis is routinely recognized as one of the more affordable regional housing markets in the nation. This relative affordability lies within the eye of the beholder as Indianapolis also fares relatively poorly in income inequality. To many low-and moderate-income households, the housing of their choice may be out of reach. 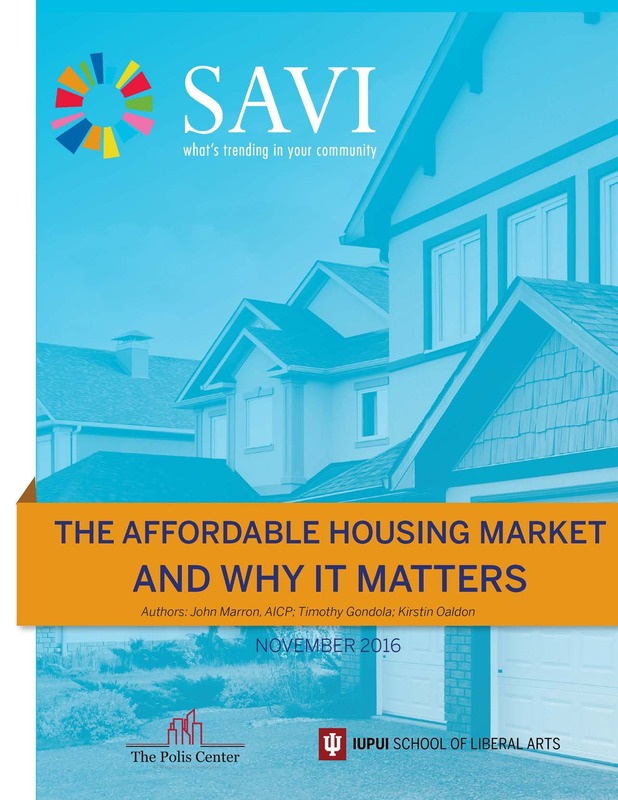 Urban Analyst John Marron looks more deeply into this issue in the report, The Affordable Housing Market and Why It Matters, produced in partnership with The Polis Center at IUPUI for the SAVI community information system. The central theme of the report: affordable housing encompasses a broader range of economic issues than the price of a home. In this report, we define the terms, affordable housing and subsidized housing, and explore the drivers and interrelatedness of each. We also look at general policy challenges in creating adequate affordable housing and the reason why it is a relevant policy goal, especially for low-income families. In addition, we provide a brief examination of policy options for local governments and civic leaders who have an interest in local and regional housing policy. All of this discussion is placed alongside relevant data for Central Indiana, Marion County, and Indianapolis. Housing affordability is measured by the cost of housing relative to income. Solutions to make housing more affordable should include solutions oriented toward promoting the development of affordable housing as well as increasing the earning potential of low- and moderate-income families. Making housing cheaper allows households to afford housing; raising incomes allows households to better afford everything. Despite its reputation, Central Indiana can do better in helping its citizens become less cost-burdened by housing.